As of last April, the internet was roughly 5 million terabytes in size. Google, most people’s go-to search engine of choice, has indexed about 200 terabytes of it…or .002% of it. The internet is unbelievably huge and according to IBM, the digital knowledge contained within it will be doubling every 11 hours by 2016. Ready to be staggered? The human brain has been estimated to contain several billion petabytes of information. I know, what the heck is a petabyte? Sounds like a Greek appetizer. A petabyte is one trillion bytes or the contents of all knowledge contained in every US academic library. Now, grasp that I just told you that your brain contains several billion of those…billions and billions of academic libraries. Do you feel powerful? You should! When I was in 1st grade, I had to learn to spell my last name and not fall off the stool using the water fountain. At the same age, my kids were doing algebra. The demand on our mental facilities is growing as fast as the demand for faster processors and bigger hard-drives. Computers require massive upgrades just to be able to run the latest software. Our brains are being conditioned to do the same. When I am at home and have a trivial question, I could get out my phone and ask Google, but most of the time, I just ask my kids. It’s faster. Here’s where the leap forward happens: those 1st-grade algebra kids, or “millennials”, are just now starting to enter the workforce. Combine the potential of the human brain with our exploding online digital database giving us the entire knowledge of the universe beamed to a lightning-fast delivery system in our front pocket and you can say hello to the far future in very short order. Therefore, let me formally welcome you to the future and the rapid changes coming our way! It seems the government (the gatekeeper) and its light-years of red tape decide just how fast these changes will be allowed to proliferate our society, but Amazon is throwing itself against the system and seems to be succeeding! 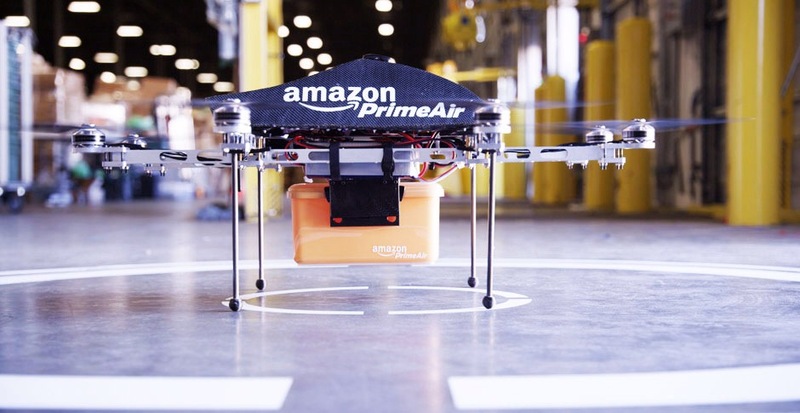 The online marketplace monster has petitioned the courts to authorize the use of drones for 30 minute package deliveries to your front door! Electronic retailing is about to change forever! Imagine localized fulfillment centers in metropolitan areas with an army of quad-copters zipping to and fro, clutching anything less than 5 pounds (86% of all Amazon products) and gently dropping them right on your front porch! They are already doing it in test markets. Let’s wrap your brain around this for a moment. You’re out of your favorite hair product. You whip out the Amazon App, hit “Buy” and by the time you’re out of the shower and dry, a new bottle is on your threshold…along with new brown socks because you just found out your last pair has a hole. For some reason, I can hear Doc Brown standing among his clocks and auto dog-feeder, yelling at Marty McFly that this will change everything! It feels fantastical, but guess what? It is here. It is now…and it is a just a snapshot of how shopping is going to change like wildfire within the next decade. Whatever you know…or think you know, hold on tight. This is just the beginning. There will be an upsweep of changes that will trend with dizzying speed. You will probably have to rethink your position every few hours…11 hours to be precise! What an amazing time it is in our world!